As a black woman, I am well aware that inequalities exist in America. I am well aware that the rate of poverty, imprisonment and unemployment of black Americans is higher than for white Americans. I don’t need NFL players who disrespectfully kneel when our national anthem is played to inform me of all this. The fact that Sunday is the one-year anniversary of the march by neo-Nazis and other white supremacists in Charlottesville, Virginia – and that the awful day is being marked by another gathering of white racists in Washington – is yet one more reminder that racial discrimination and other forms of hatred have not disappeared. While I firmly believe America is the greatest nation on Earth, it would be silly to claim we are perfect and that no problems exist. [post_ads]I understand the argument – though I disagree with it – that when football players began kneeling or raising a fist during the playing of “The Star-Spangled Banner” two years ago they felt they were making some white Americans aware of the problems of racial discrimination. 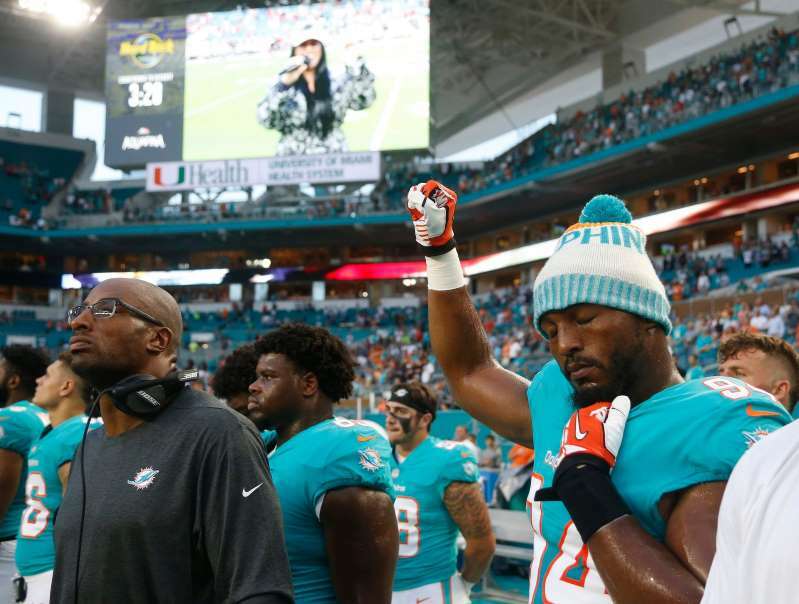 But at this point – after two years of protests, after NFL owners committed to donating $90 million over seven years to social justice causes, after the announcement of transformative prison reform, and after many arguments between family and friends – do we really need the kneeling and the fist-raising to continue? What is this all accomplishing? Are we going to have to endure yet another football season marred by these pointless and divisive protests? The players say they don’t disrespect the American flag, don’t disrespect our national anthem, and don’t disrespect military veterans like me who stepped forward to serve our country. Well, I say they do! Who’s right? Do we continue with this tug-of-war with no end in sight? Do we continue to draw straws to figure out who is more victimized? Who is poorer? Who is more privileged? Americans are exhausted from all of this arguing. We can all complain about problems black people face and problems people of other races face. We can complain about problems America faces. But at some point we need to focus on actually solving these problems by working together as brothers and sisters, all created equal. Arguably, President Trump – the most powerful man in the world – has been made aware of the issues plaguing the black community and has made a huge conciliatory gesture of goodwill towards some of his most ardent critics – black NFL players. A little over two months ago, President Trump invited NFL players to give him the names of people they believed were unjustly imprisoned and ask him to grant pardons. Most Americans may think the president’s offer was too good to pass up. However, it’s been over two months since the offer was first made. How many NFL players, specifically those who are kneeling, submitted a name to the president? Time will tell if these self-appointed burden bearers will take the president up on his offer and speak with him. But if past results are indicative of future performance by those within the black community who have a strong dislike (to put it mildly) for this president, I suggest we don’t hold our breaths. Remember rapper Meek Mill, who was released earlier this year from prison after violating his probation and who also accused the prison system of treating him unfairly? He presents himself as a staunch advocate for prison reform and he initially accepted an invitation to attend a prison reform summit at the White House. After receiving a phone call from friend and fellow rapper Jay-Z, who has never concealed his dislike for the current administration, Meek issued a statement declining the White House invitation. In an interview with the Rev. Al Sharpton, Meek said he knows exactly how to fix the problems we see in the inner city. He just needs the right support to make it happen. Here was Meek’s big chance to speak directly to the president of the United States to share his solutions and his experiences. Ultimately, peer pressure outweighed any of his public proclamations to help heal the black community. In a very real sense, NFL players like Malcolm Jenkins, Michael Bennet, Kenny Stills, Albert Wilson, Robert Quinn and Terrell Suggs – maybe even former quarterback Colin Kaepernick – have in their hands the power to radically change the lives of people they believe are wrongly imprisoned. They have it within their grasp to make a real tangible difference in someone’s life. Instead, it appears they would rather fight against President Trump than fight on behalf of the people they claim to be working to help. There are so many more productive things these millionaire players could do to help the black community than kneeling. How about donating 10 percent of their huge salaries to help those in need with college scholarships and job-training programs? How about partnering with some of their high net worth friends to invest in inner city businesses to create jobs for black people? How about taking their celebrity into inner cities like Chicago and Detroit to shine a spotlight on the failed liberal policies that are decimating those communities? How about working constructively with police departments and the black community to increase the number of black police officers? I could list dozens of “how abouts.” The point is, there are many things NFL players could be doing to accomplish more to fight racism and to help black people build better lives than kneeling and raising their fists. And to the protesting players, I say: A good place to start would be to get off your knees. You have made everyone aware. Now it’s time to partner with those who have the ability and the resources to make the changes you keep talking about. And the person who has the greatest ability to help you is President Trump. I understand many of the protesting NFL players never voted for President Trump and never will. I understand they have fundamental disagreements with many of the things he does. But like it or not, Donald Trump is the duly elected president of the United States. He has the power to help black Americans, if we work with him rather than against him. My question for the protesting NFL players is this: Are you more interested in staging protests for show, or in changing things for the better in our country? Get up off your knees already and work to make America a better place for black Americans and all Americans. It may sound sappy, but as the old folksong goes: “This land is your land and this land is my land.” This is our home. Let us now move beyond just raising awareness of problems to offering real solutions.